Mr. Church aka Bruce Willis returns once more to recruit the services of Barney Ross (Sylvester Stallone) alongside the biggest collection of action stars of the big screen both past and present. The original 2010 film topped the US box office and was a major worldwide hit grossing over $275m. 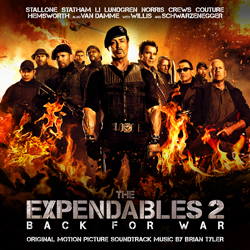 Composer Brian Tyler is one of the most prolific creators of action scores in the business. In the last decade he has created a wide selection of music for many films including Children Of Dune, Constantine, Annapolis, The Fast And The Furious, Aliens Vs Predator – Requiem and Battle Los Angeles. His previous releases on Silva Screen, Rambo (SILCD1260) and The Expendables (SILCD1339) have been consistent sellers and the former has been applauded as a fine successor to Jerry Goldsmith’s original music for the series.